Three people stand on a busy street corner in Madison holding homemade posters. They wave and smile at the occasional car that honks as it drives by. The poster holders are three of about 10 Mike McCabe supporters who have posted up along Midvale Boulevard in Madison, hoping to lure the politically agnostic into an event where McCabe is speaking. Mike McCabe supporters Sarah Wilson, James Zumstein and Ed Jeannette hold signs outside a McCabe campaign event in Madison. Laurel White/WPR. 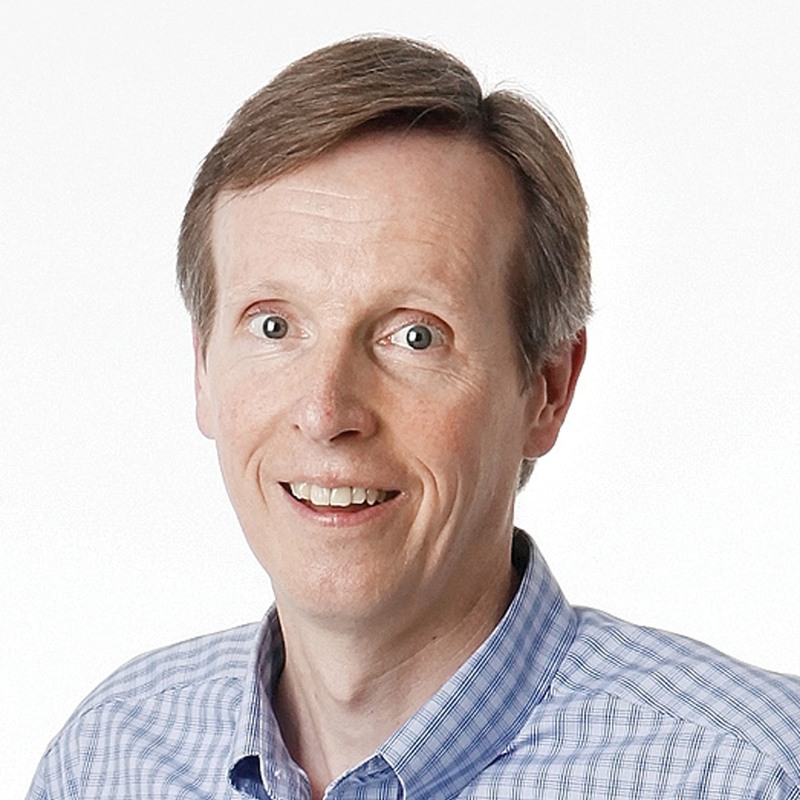 McCabe, 58, is one of several Democrats jostling for the chance to face Gov. Scott Walker in this fall’s general election. But first, he has to win August’s partisan primary. Sarah Wilson, 26, one of the McCabe supporters, said this is the first time she’s ever volunteered for a political campaign. She doesn’t have anything to compare it to, but she said she feels heard and valued — like her ideas and work for the McCabe campaign really matters. 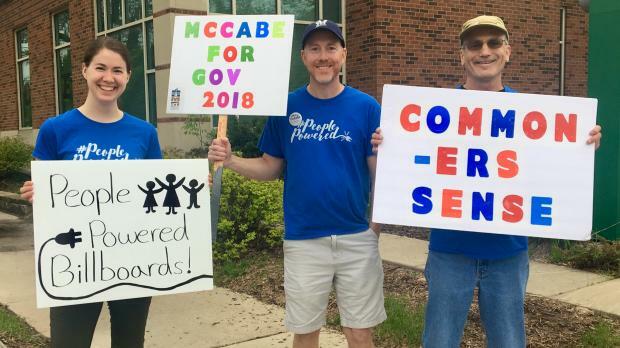 Wilson said supporters are making McCabe posters and standing on street corners and sidewalks all across Wisconsin, even when McCabe isn’t in town for an event. The whole point is to get his name out there. Alice Schneiderman, another volunteer, said she feels like she really knows McCabe. She’s never felt that way about a politician before. Schneiderman said she has gone door-to-door in her neighborhood to invite people to attend a McCabe meet-and-greet at her house. She jokes that she brings up McCabe at places like the gym to anyone who will listen. One of her workout class companions now volunteers for the campaign, too. This type of enthusiasm isn’t uncommon for McCabe supporters, who liken him to political figures like Bernie Sanders and Bob La Follette. Schneiderman said she was drawn into the McCabe campaign after hearing him talk about campaign finance and his commitment to eschew any big money donations. McCabe said that’s a big part of his campaign philosophy. He won’t take any single campaign donation over $200 — no money from big donors or PACs. “All the work I’ve done over the course of virtually my entire adult life has shown me that there are strings attached to those checks,” he said. McCabe helped launch the Wisconsin Democracy Campaign, a group that tracks money in politics, in the mid ’90s. For years, he was the go-to guy in the state for information about financial misdeeds by politicians of either party. Now he says it’s time to practice what he preached. “This is an opportunity to replace all that money power with people power,” McCabe said. “This is an opportunity to replace all that money power with people power,” Mike McCabe said. Empowering regular people to engage with politics isn’t an uncommon political strategy, but some argue there are elements of McCabe’s campaign that are particularly reminiscent of a major figure in Wisconsin political lore: former U.S. senator, congressman and governor La Follette. Nancy Unger, professor of history at Santa Clara University, has written books about Bob and Belle La Follette. She believes the lines drawn between McCabe and La Follette are reasonable. For all the passion McCabe has inspired with his campaign, he’s also drawn substantial ire from some on the left. McCabe has worked for Republicans in the past and won’t promise he’ll endorse the eventual Democratic nominee for governor if it’s not him. “I think it undermines the credibility of the person who’s asking people for votes as a Democrat who says they’re not willing to support the Democratic nominee,” said Scot Ross, executive director of One Wisconsin Now, a liberal advocacy group. McCabe said he doesn’t agree with the idea that any member of the Democratic Party is better than Walker. For Ross, that’s a big problem. “I don’t care who gets out of the primary — they are all in a different solar system in terms of how lousy Scott Walker is and what a disaster it would be for him to be governor four more years,” he said. When asked about this particular dustup, McCabe stands his ground. He said it’s disrespectful to voters to imply candidates are interchangeable, as long as they have a “D” behind their name. “I really want this campaign to give voters the opportunity to feel really good about casting a ballot for a change, because heaven knows people feel doomed in election after election to choose the lesser of evils,” he said. Armed with “people powered billboards” and $200 donations, McCabe aims to ride that wave of hope and optimism all the way to a general election victory in November. 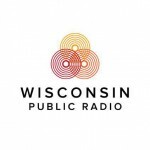 Democrat Mike McCabe Runs ‘People Powered’ Campaign In Bid For Governor’s Office was originally published by Wisconsin Public Radio. Anyone but corrupt, Career Politician Scott Walker with his greasy, corrupt, Dark Money pay to play schemes like Walker giving his campaign finance director the FoxCON development contract. What a crooked, corrupt SCAM! No more republican gerrymandering stealing our voting rights! No more republican Dark Money! No more republican pay to play schemes! No more scapegoating and blaming women, minorities, gays, working class and poor folks for everything while giving the mega-rich and corporations huge tax breaks! No more scottholes in our roads! No more school funding cuts! No more Republican corruption and career politician MOOCHERS like Walker!! No more corporate welfare for FoxCON!! Good lucking beating Governor Scott Walker, the single greatest and most transformative governor the State of Wisconsin has ever been fortunate enough to elect time after time! Another oppressive white man asks victimhood minorities to vote for him. LTNR, greatest, “gag” governor?? WI poverty rate for 2016, up 1% adults, for children 2% and this is an increase over the 2015 increase in WI poverty. People maybe working, but not for a living wage or any benefits. Oh and Yes, Mr. Gag is an oppressive white man to all except the top 5%. So today the Supreme Court ruled on purging names off the voter registration rolls in Ohio. Judges appointed by Republicans voted “yea, purge them”, judges appointed by Democrats voted “no don’t purge them”. And there seems to be one party that doesn’t have much of a problem repealing net neutrality. To those that are so pure and so just that they can’t see the difference between the two parties I say maybe get a clue. Troll being a white male, a totalitarian, and white supremacist is in fact the most victimized majority in this country.